Before I get into my 1st call, a reminder that a new Snow Poll is at the right side here. That is your 1st call for total snow at BWI. This includes beginning and end of storm, by Sunday night. If snowflakes from the clouds melt. If there is a chance to refreeze before reaching the ground. Freezing Rain: Falls as rain, freezes on the ground. The most extreme I have seen was in Danbury, CT with rain at 19F. A few years ago we have drizzle at 21F in front of ABC2 Studios. Being my day off, this will be brief... The models have been all over the place. There general idea I see is slower with the development of the coastal Low. This will make for a longer duration event. Considering the Coastal Low synopsis, it also means a better chance that we have an ice storm. 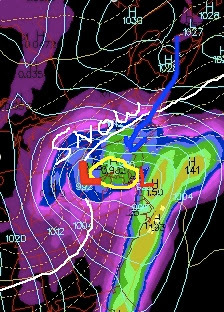 Calling total snow will be tough since I still think we will see it on the bookends - both beginning and end of the storm Sunday evening. All snow line will be well to the north - highlighted in white. 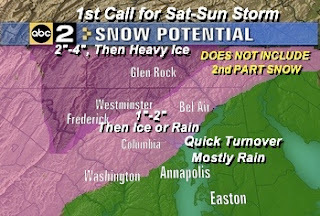 Most likely we get between 1/2 and 3 inches (north) of snow then change to sleet/freezing rain quickly after dark. This coastal Low during Sunday should bring us back to snow around noon. Depending on the strength and position we could pick up a few inches on the back side before ending. There is model support for the warm air to get in with temps in the upper 40s Sunday morning. I don't fully agree with that. Cold air damming usually is tough to break west of the bay. That is why I-95 or the bay often ends up as the dividing line. The cold air gets banked up just east of the mountains. Its possible that Frederick and Carroll counties have much more ice than Frostburg which will likely turn to rain closer to the primary low. Again this is 'roughly' what I see right now. It could all change with just a shift 50-100 miles on tonight's models. One thing to look out for is how cold it gets tonight. If we end up low to mid 20s before the clouds roll in, it will hold us lower at the onset. Updated at 3:30pm: It should be noted that storms like to set footprints for themselves. In this case the snow or ice pack can lock in the freezing air. But something that should not get left out is the wind on the back side of this storm..GALE FORCE in the metro areas throughout the region. That means if there is ice on trees, etc., it will be a major problem. Still thinking just north and west - as typical. I'll get back Saturday morning. This whole event will also determine if I have to get back to work myself this weekend, so I have a personal investment here. I appreciate your blog and your honesty! I guess we will all have to wait and see what will happen! Thank you for your prediction!!! The anticipation is killing me here!